Welcome to the website of Professional Origami Artist Stacie Tamaki. Since arriving in Michigan in 2014 Tamaki has pursued art as her full time career. This website is updated regularly and her Tinygami Instagram account has become a daily photo journal of her efforts since her arrival. As Angela Martinez, host of Crafters Coast to Coast on HGTV, once said about her work: "She may work in miniature but her talent is huge!" View a gallery of images for each mobile including a description of its theme, size (most are approximately 8" in diameter and 24"-31" high), the materials it's comprised of, and photo build journals that show my step by step process. The most recent updates about my work, studio, the folding club and more are always on Instagram. You can follow there at instagram.com/tinygami or check back and take a peek below. Recently I was interviewed by Yuri Cataldo, host of the Advance Your Art podcast. We chatted about when I learned origami, how it progressed from a hidden hobby to my full time profession, how my health situation has impacted my art, what advice would I share with fledging artists, why do I create, and what is my art's purpose in my own life and the lives of those who view it. Established in June 2017 West Michigan Origami is a folding club (similar to a knitting club, but with paper). There is an official Facebook Group Page and/or an official web page on this website. Join either for notifications of upcoming meetups. Recommended ages are 8 and up. All experience levels are welcome. Bring a project you're working on or come learn. Please RSVP if you plan to attend. The 60 seconds that changed everything: Michigan origami artist Stacie Tamaki is an expert at crafting tiny origami -- so much so that she's made a full-time career out of it. For her, it's not just a job, but also a lifestyle. Every year, she presents her miniatures at the Grand Central Market & Deli in Michigan, and fans can purchase her art on etsy. By WGRD 97.9 Matt Milhouse: Stacie Tamaki brought miniature origami to Grand Central Market & Deli in Grand Rapids for the third straight year for ArtPrize. 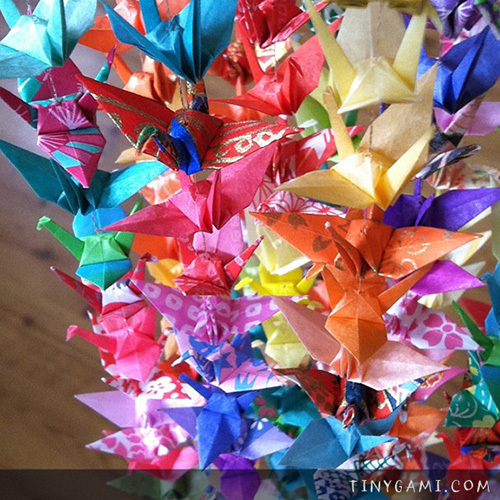 Watch as Tamaki demonstrates how she makes "Tinygami" and offers tips for beginners. What kind of paper do I use? Where do I get my paper? Do I cut my paper into tiny pieces or buy it that small? These are the questions I've now been asked thousands of times. Since they are pretty consistent I thought I’d compile them together into an FAQ blog post. In the summer of 2017 I started a West Michigan Origami Folding Club. It meets monthly and is an informal group session where folders can gather to work on current projects and share (ideas, tips, instructions, paper, paper sources, etc.) as well as mentor new folders into the art of origami. If you are interested in joining please sign up on the new club page to RSVP and for future updates. All contents on this website are © (copyrighted) by Stacie Tamaki. All rights are reserved. Use the contact page to request permission.